The statistic depicts how respondents rated the impact of different sources of calories on weight gain from 2013 to 2018. 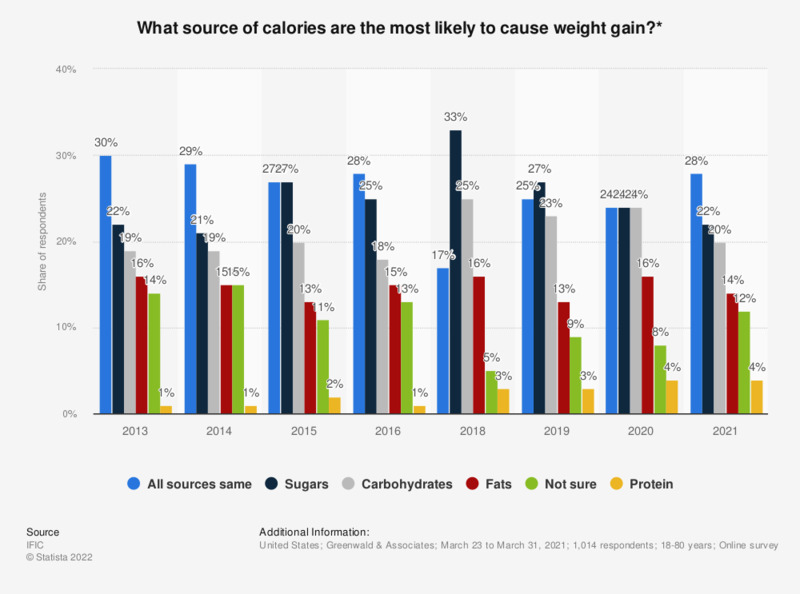 In 2018, some 25 percent of U.S. respondents stated to believe that carbohydrates are the most common source to cause weight gain. * The results are weighted to ensure that they are as reflective as possible of the American population ages 18 to 80. Everything On "Eating behavior in the U.S." in One Document: Edited and Divided into Handy Chapters. Including Detailed References. Statistics on "Eating behavior in the U.S."
Thinking about the past year, how has your opinion changed, if at all, about added sugars? Are you trying to limit or avoid sugars in your diet? Which of the following actions do you perform regularly when cooking, preparing, and consuming food products? Where do you usually buy groceries to prepare home-cooked meals? When do you prepare home-cooked meals? Which cuisine do you prefer, when preparing home-cooked meals? When preparing home-cooked meals who is most often with you? For what occasions do you prepare home-cooked meals? Which of the following are reasons why you personally try to include a certain amount of protein in your daily diet? U.S. population: How many pounds of margarine / margarine spread have you used in the last 7 days?